PVMBG reported that seismicity at Ruang decreased from 14 March through 2 June. Emissions were unobserved during periods of clear weather from 1 May through 2 June. The Alert Level was lowered to 1 (on a scale of 1-4) on 3 June. Residents and tourists were warned not to approach the active craters. The 25 September 2002 eruption of Ruang (BGVN 27:10 and 28:08) was, according to the Darwin Volcanic Ash Advisory Center (VAAC), the largest in Indonesia for many years and was well observed by satellite sensors. The eruption cloud reached a height of ~ 20 km, and a pyroclastic flow toward the SE damaged an area 1.6 km². Although no village was hit by the pyroclastic flow, two were heavily damaged by very thick ash material. The Darwin VAAC and Bureau of Meteorology have published images and animations of the eruption clouds (figure 2). The satellites and images included those from Aqua/MODIS, GMS Java Animation, and AVHRR sensors. Some ash clouds dispersed towards Singapore and Jakarta. A higher level cloud remained nearly stationary near the tropopause (the top of the troposphere, where most of the Earth's weather occurs). The highest cloud moved eastwards in the stratosphere. The color/shading reflects the strength of the detected ash signal. Figure 2. Night-time infrared image of the Ruang eruption processed to highlight volcanic ash. N is towards the top; the local island margins are shown, Sulawesi to the right and Borneo to the left. The enhanced areas disclose the W portion of the plume drifting over Borneo and the higher E ash and gas cloud nearly stationary over the eruption site. A third area of ash and ice cloud is nearly invisible near the bottom center. Courtesy of NASA, NOAA, and the Darwin VAAC. The TOMS scientists published an image on their website (figure 3), described as follows: "The TOMS overpass on September 25 was too early to capture the fresh eruption cloud, but ash and SO2 were evident on the following day. The aerosol signal over S Borneo is at least partly due to smoke from biomass burning; the ash cloud from Ruang can be seen over NE Borneo. A data gap may be obscuring any SO2 or ash immediately W of Ruang." Figure 3. Ruang erupted on 25 September 2002. A pass the next day of the Earth Probe satellite with the Total Ozone Mapping Spectrometer (TOMS) instrument yielded this map of SO2 concentrations. Courtesy of Simon Carn and Arlin Krueger. Information Contacts: Darwin Volcanic Ash Advisory Center (VAAC), Commonwealth Bureau of Meteorology, Northern Territory Regional Office, PO Box 40050, Casuarina, NT 0811, Australia (URL: http://www.bom.gov.au/info/vaac/); Nia Haerani, Directorate of Volcanology and Geological Hazards (formerly VSI), Jalan Diponegoro No 57, Bandung 40122, Indonesia (URL: http://www.vsi.esdm.go.id/); Simon A. Carn and Arlin Krueger, Joint Center for Earth Systems Technology (NASA/UMBC), University of Maryland, Baltimore County, 1000 Hilltop Circle, Baltimore, MD 21250, USA (URL: https://so2.gsfc.nasa.gov/). PVMBG reported that emissions from Ruang were unobserved during periods of clear weather from 1 January through 12 March. Seismicity increased starting on 6 March prompting PVMBG to raise the Alert Level to 2 (on a scale of 1-4) on 12 March. Residents and tourists were warned not to approach the craters within a 1.5-km radius. During 21-27 October, a thick low-level ash plume infrequently rose above Ruang. Rainfall on 23 October caused lahars to flow down the volcano's flanks during 1445-1545. Ruang remained at Alert Level 2 (on a scale of 1-4). VSI reported that following the 25 September Ruang eruption there was no significant volcanic activity; only thin white clouds rose 100 m above the summit. On 30 September VSI decreased the Alert Level at Ruang from 4 to 3 (on a scale of 1-4). VSI increased the Alert Level at Ruang to 4 (the highest level) when the volcano began to erupt on 25 September at 0100. During the 7-hour eruption an ash cloud rose 0.5-1 km above the summit. Ruang erupted again at 1140, producing an ash cloud that VSI reported rose to 5 km above the summit. According to the Darwin VAAC, satellite imagery revealed that an ash cloud reached ~16 km above the volcano. People living near the volcano at desa Pumpente and desa Laimpatehi were evacuated. Pilots from Qantas Airlines reported an eruption around 1600 on 27 June. A plume moved W and reached an altitude of about 6,000 m. However, the eruption was not visible in GMS satellite imagery. Information Contacts: Bureau of Meteorology, Northern Territory Regional Office, P.O. Box 735, Darwin, NT 0801 Australia; NOAA/NESDIS Satellite Analysis Branch, Room 401, 5200 Auth Road, Camp Springs, MD 20746, USA. The last reported activity at Ruang occurred when Qantas Airlines pilots observed an eruption around 1600 on 27 June 1996 (BGVN 21:08). A resulting plume moved W and reached an altitude of ~6 km. However, the eruption was not visible in GMS satellite imagery. The last known confirmed eruption at Ruang occurred in 1949. A drastic increase of seismic events - from 3 to 24 events/day - was observed on 24 September by the Volcanological Survey of Indonesia (VSI). The next day, people near the volcano reported hearing a noise, and ash eruptions began by 0100. By 0300 ash emissions were continuous, and ash began falling around Ruang island and the nearby island of Tagulandang. Observers reported that the sounds accompanying the eruption were weak. By 0400 more than 1,000 people living near the volcano were evacuated to a nearby island. Around 0800, the Alert Level advanced to the highest status (level 4). The first strong eruption commenced at 1140 on 25 September, producing thick black clouds that rose 3 km. Ten minutes later, a second eruption sent ash clouds rising 5 km. At 1210 the activity subsided enough to observe glowing material on E flank. The specific eruption site has not been firmly established. It has been presumed by VSI that it originated from "Crater II" or "where the 1949 lava originated (E side of summit)." The eruption column was reported from ground-based observations as rising to at least 5 km, and by Darwin VAAC advisories as rising to about 17 km. According to the Darwin VAAC, satellite imagery revealed that the ash cloud drifted westward to Borneo and Sumatra. Satellite images from NOAA showed the plume drifting SW with other components drifting W (figure 1). By 30 September the volcano was quiet with only a thin white plume rising about 100 m. The Alert Level was reduced from 4 to 3 on 30 September 2002. Figure 1. Satellite imagery on 25 September 2002 showed a large eruption plume from Ruang. The volcano's location is shown by the arrow. The plume appears to branch into SW- and W-drifting components. Courtesy NOAA. Information Contacts: Volcanological Survey of Indonesia (VSI), Jalan Diponegoro No. 57, Bandung 40122, Indonesia (URL: http://www.vsi.esdm.go.id/); Darwin Volcanic Ash Advisory Center (VAAC), Bureau of Meteorology, Northern Territory Regional Office, P.O. Box 735, Darwin, NT 0801 Australia; NOAA/NESDIS Satellite Analysis Branch, Room 401, 5200 Auth Road, Camp Springs, MD 20746, USA. Volcanic activity had decreased by 30 September 2002 after a strong eruption on the 25th. After the hazard status was lowered from Alert Level 4 to 3 on 30 September, it was dropped to Level 2 during the week of 7-13 October. However, activity continued to be higher than normal that week, with frequent strong emissions and "thick white ash" rising ~100 m above the summit. Emission earthquakes decreased (table 1). High-pressure plumes decreased in frequency from 14 October through 10 November, but "thick white ash" continued to rise from the summit. No ashfall was reported during October or November. Rainfall on 23 October caused a lahar. No volcanic or emission earthquakes were recorded during 4-10 November, and the Alert Level was reduced to level 1. Table 1. Seismicity at Ruang, 7 October-10 November 2002. Courtesy of VSI. Ruang volcano, not to be confused with the better known Raung volcano on Java, is the southernmost volcano in the Sangihe Island arc, north of Sulawesi Island. 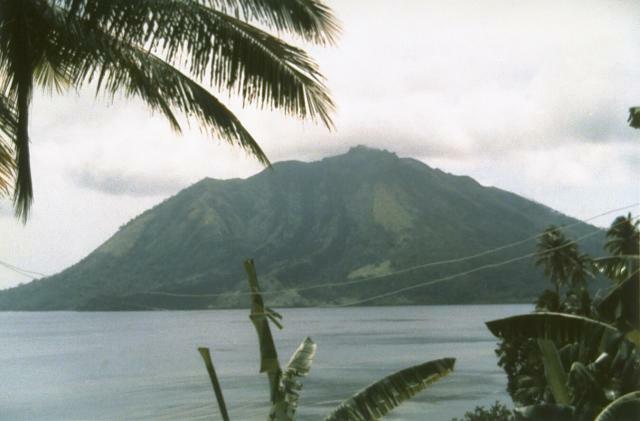 The 4 x 5 km island volcano rises to 725 m across a narrow strait SW of the larger Tagulandang Island. The summit contains a crater partially filled by a lava dome initially emplaced in 1904. Explosive eruptions recorded since 1808 have often been accompanied by lava dome formation and pyroclastic flows that have damaged inhabited areas. Neumann van Padang M, 1959. Changes in the top of Mount Ruang (Indonesia). Geol en Mijnbouw, 21: 113-118. There is no Deformation History data available for Ruang. Ruang volcano, seen here from the nearby island of Tagulandang, forms a small 4 x 5 km island that is part of a chain of islands extending north from Sulawesi. Explosive eruptions, recorded in historical time since 1808, have been accompanied by pyroclastic flows and lava dome formation, and have frequently caused damage to populated areas. Photo by Suratman (Volcanological Survey of Indonesia). There are no samples for Ruang in the Smithsonian's NMNH Department of Mineral Sciences Rock and Ore collection. Large Eruptions of Ruang Information about large Quaternary eruptions (VEI >= 4) is cataloged in the Large Magnitude Explosive Volcanic Eruptions (LaMEVE) database of the Volcano Global Risk Identification and Analysis Project (VOGRIPA).